We're big fans of Spanish surrealist Luis Buñuel here at Outsider, and there are few filmmakers out there with so many great movies under their belt. One of our favourites is his biting 1972 satire The Discreet Charm of the Bourgeoisie, the film that so upset a character from Whit Stillman's Metropolitan because he hilariously took the title at its word. It has a simple sounding plot. Six pillars of society repeatedly try to have dinner together, but their plans are interrupted by events both real (scheduling mix-ups, a restaurateur's death) and increasingly surreal, which are realised as series of typically Buñuellian dream sequences). Jean-Pierre Cassel, Delphine Seyring, Stephane Audran, Bulle Ogier and long-time Buñuel collaborators Fernando Rey and Paul Frankeur head the extraordinary cast of a film made when Buñuel was 72 years old. Full of passion and fire, it was the 1972 Oscar winner for Best Foreign Film and BAFTA winner for Best Screenplay. It remains one of Buñuel's most popular and celebrated films. 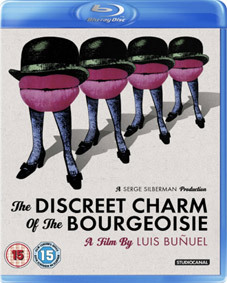 To mark the film's 40th anniversary, The Discreet Charm of the Bourgeoisie will be released on UK DVD and, for the first time ever in the UK, on Blu-ray on 16th July 2012 by StudioCanal at the RRP of £15.9 for the DVD and £19.99 for the Blu-ray.